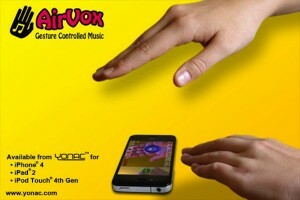 Control sounds on your iOS device with your hands just like a Theremin with AirVox. Remember the Groovebox D-Beam (MC-505) controller technology by Roland? This is a lot like that. Introducing a REVOLUTION: use gestures to perform music on your iOS device with amazing precision! 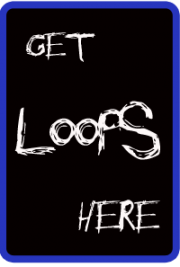 Simply use your right hand to control the pitch and your left hand to control a selected sound parameter. It may look magical, but AirVox is actually our product of cutting-edge computer vision technology crafted for mobile devices. Now available in the iTunes store for devices with a front-facing camera: iPhone 4, iPad 2, and iPod Touch 4th Gen.
Kinda makes me wonder when the real Theremin company is going to catch on with their app. This one uses the Accelerometer for all you 3G and 3Gs users. Introducing Theremin, one of the first electronic instruments – digitalized and resized – for eerie sounds on the go! Developed in Russia back in 1919, Leon Theremin’s classic instrument enjoyed popular (if not commercial) success in the 1920’s and 30’s, due to the virtuoso classical performances of Clara Rockmore in the 1920’s and 30’s; and later due to the theremin’s use in the sci-fi soundtracks by thereminist/podiatrist Dr. Samuel Hoffman. Controlling theremin is easy: with the iPhone held out in front of you, turn it clockwise for a higher pitch, counter-clockwise for a lower pitch. Tilt the phone face-down (or face-up) to add vibrato. And use the on-screen volume control to continuously adjust amplitude. A status line shows you the current frequency, pitch (e.g. A#), and volume. As you perform, so does Mr. Theremin. His hands move toward and away from the theremin’s antennae, tracking pitch with his right hand and volume with his left. And thanks to technological process, we can make it available to you for approximately 0.2% of the price of the original instrument! And that’s not even adjusting for inflation! Try Theremin … for fun sonic weirdness anytime, anywhere!